Rice (Oryza sativa) belongs to the grass family and is one of the most important foods in the world. The grass has long, slender leaves and it is cultivated in countries and regions with low labor costs and high rainfall, as it is very labor-intensive to cultivate and requires plenty of water for cultivation. Rice is roughly divided into two types: Japonica and Indica. The characteristics and forms of these two types of rice differ. The grains of Japonica are round and do not easily crack or break. Indica rice is long and tends to break easily. 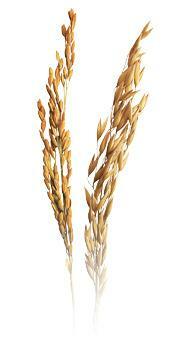 Rice can be classified according to the degree of milling that it undergoes. Brown rice, often referred to as whole rice or cargo rice, is the whole grain with only its inedible outer hull removed. Brown rice still retains its nutrient-rich bran and germ. White rice, on the other hand, is both milled and polished, which removes the bran and germ along with all the nutrients that reside within these important layers. Parboiled rice is subjected to a steaming or parboiling process while still a brown rice. This causes nutrients from the outer husk, to move into the grain itself. The rice is then dried, and can then be milled as usual or used as brown rice. Rice has a long history of cultivation in Asia. For the majority of its long history, rice was a staple only in Asia. Up to know the majority of the world's rice is grown in Asia, where it plays an incredibly important role in their food culture. China (187,397,460 MT) and India (144,570,000 MT) are the leading producers of rice in the world (2007). Rice is probably the most important grain with regards to human nutrition. It is the most important staple food for a large part of the world's human population in East, South and Southeast Asia, the Middle East, Latin America, and the West Indies. It is usually cooked to be eaten.